Module 6: Elemental Evil of Neverwinter Online was released April 7, 2014 and with it a series of four new zones and a brand new class arrived. In order to get a look at the game, many people flocked to the servers the moment they went up and crashed the PC servers for a little while. Each of the new zones fits a particular element Water, Earth, Fire, and Water. As a result of the four new zones added to the game the level cap has been raised from 60 to 70 and the new zones added have become leveling zones with progression and storylines that lead through them. The newest class added to the game, the Oathbound Paladin, adds a team-focused protector and healer to the game who wields a sword and mace. Paladins can take the role of healer or tank and have numerous abilities that bolster allies via auras or debuff enemies by causing their damage to be reflected or power reduced. The Elemental Evil module release is only for the PC currently; looks like Xbox players will have to wait. Module 6: Elemental Evil is named after an ancient Dungeons & Dragons campaign sourcebook of a similar name. In Neverwinter Online, however, it’s not just a temple that players will be exploring it’s an entire set of new zones, companions, and a whole new faction to fight against: the Cults of Elemental Evil. Each of these zones is afflicted by a particular elemental effect including Drowned Shore/Reclamation Rock and Firey Pit/Spinward Rise. The Drowned Shore is a new zone afflicted by the element of water and the Elemental Evil cultist who gather there fit that element. The zone is the blasted wreckage of the Blackdagger Ruins, which have been devastated by a powerful tidal wave that pulverized the lighthouses and other structures that once stood there. Reclamation Rock is a towering rocky prominence that looms over the retaken city of Helm’s Hold and is populated by an Elemental Evil cult dedicated to the element of earth. The Rock is a powerful fortress that is strategically defended by craggy rocks and a difficult approach. Making things worse, the pillared-fortress itself burst forth from the ground where players launched their counter-attack against the Ashmadai (the hell-borne tiefling cult) and now the new cultists roam the streets and forests. The Firey Pit is a locale that lives right up to its name through a repurposing of the Great Forge in the lost dwarven city of Gauntlgrym. Deep within the forge slumbered a great bound fire primordial named Maegera, to whom the fire elemental cultists who flocked to the Firey Pit pledge their allegiance. It will be up to players to clear out the cultists and retake the forge in this newly created PvE levelling zone based on the Gauntlgrym PvP zone. Wrapping up the elements with air is the Spinward Rise, high above Neverwinter Wood. The Cult of Harrowing Hatred—what a name—and the Nimbus family of cloud giants have constructed a stronghold atop a series of floating islands. As with every other zone, the elemental cultists have taken over the area and are working to resurrect powerful air elemental forces for an invasion—it will be the task of the players to march on these island fortresses and pry the cult loose of their footing. With the release of a new character class that relies on heavy armor, honor, and the grace of the gods has arrived: the Oathbound Paladin. She will march into battle with a trusty shield to protect her companions and a bludgeoning mace to batter down the enemy. As most paladins in the Dungeons & Dragons game world use a sword and shield, the mace-type weapon led to a bit of controversy pre-release. But how does the Oathbound Paladin play? Players who choose the Paladin get to pick between two paragon paths called Oaths: the Oath of Protection and the Oath of Devotion. Protection Paladins receive a big boost to damage resistance (10%) and a huge boost to threat generation (500%), and as the Paladin takes damage she receive a power-boost based on the total damage taken up to 10% of total health. As for Devotion Paladins, healing is increased (100%) and when healing allies their stats are increased by 5% for 10 seconds. As a result, the Paladin is well suited for group-settings as either a tank or a support-healer role. 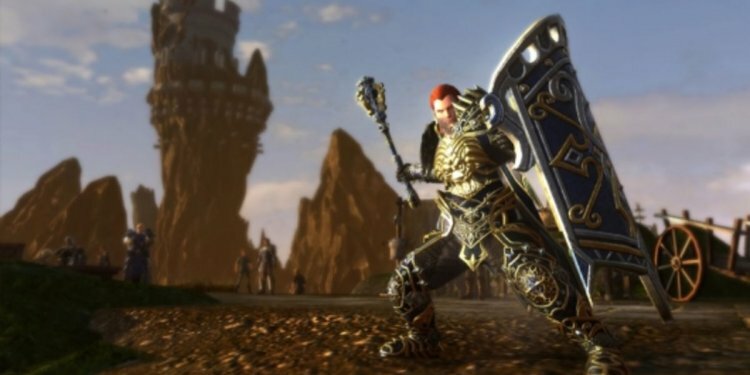 The Paladin is the second class to go with a one-handed weapon and a shield, the first being the Guardian Fighter. In spite of this similarity, the Paladin fights quite differently. Most importantly the shielding mechanic changes—for the GF, raising a shield means blocking incoming damage aimed at the GF and poking at the enemy to taunt them; for the Paladin, raising her shield means projecting a defensive field around her to lower damage done to nearby allies. The TAB-ability of the Paladin is “Divine Call.” Basically this works as an AoE shout that taunts all enemies and heals allies within 30’. Protection Paladins gain 10% extra damage resistance for 10 seconds after taunting enemies and reflect 5% incoming damage while the buff is active. Devotion Paladins throw heavier heals and any second Call cast within 10 seconds heals 50% more. As a result of auras and oaths Paladins are well-suited to act in the role of boosting the team and hindering the enemy. The area-wide shield and abilities that generate threat or heal means that paladins fall into a heavy support role rather than high DPS. However, they’re also heavily armored and can take a massive beating if necessary.